First off: I didn’t use Splenda, stevia or anything of the sort. Sure, a packet of it is ok in my coffee but there’s no masking that sugar-substitute taste when using it in large quantities. Splenda also lacks the volume of sugar, so you have to contact your local chemist to figure out how to compensate for the difference. I chose instead to use neufchatel cheese, which is basically cream cheese with 1/3 less fat. Generally speaking, I try to avoid fat free, processed products since they’re usually stuffed with lots of other, unnatural ingredients in order to make up for the lack of fat (AKA flavor). I also used raw blue agave nectar in place of sugar, and although I was a bit concerned about substituting a liquid sugar for a dry one, it didn’t seem to affect the final product one bit. Victory! 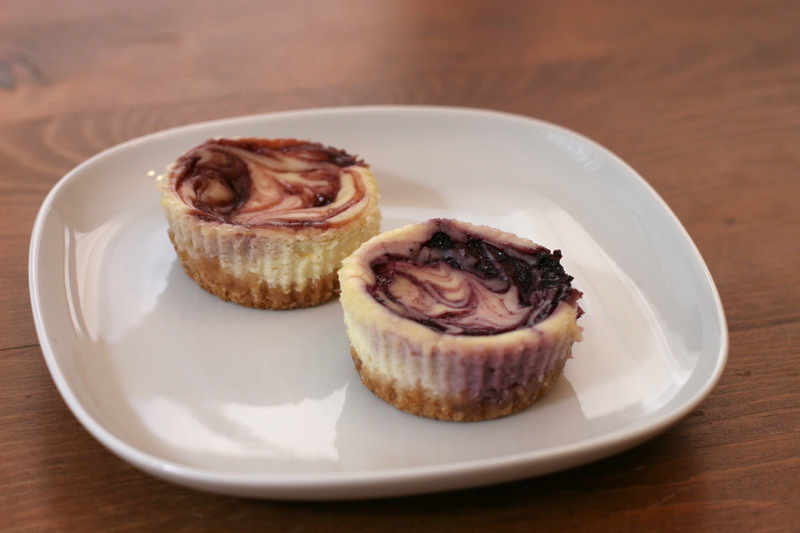 Of course the jam I swirled into each cheesecake did contain plain ‘ol white sugar, so just keep in mind these contain less granulated sugar but are not sugar free. You can use any high-fiber cereal for the crust- I just happened to have my favorite- Grape Nuts- on hand so I used those. I don’t know what it is about those teeth-shattering nuggets but I just love them. These cheesecakes were a hit with some of my friends as well, so I hope you’ll get a chance to make them. I’m not a nutritionist, but I calculated the ingredients and each cheesecake has roughly 134 calories and 8 grams of fat- not bad, right?! 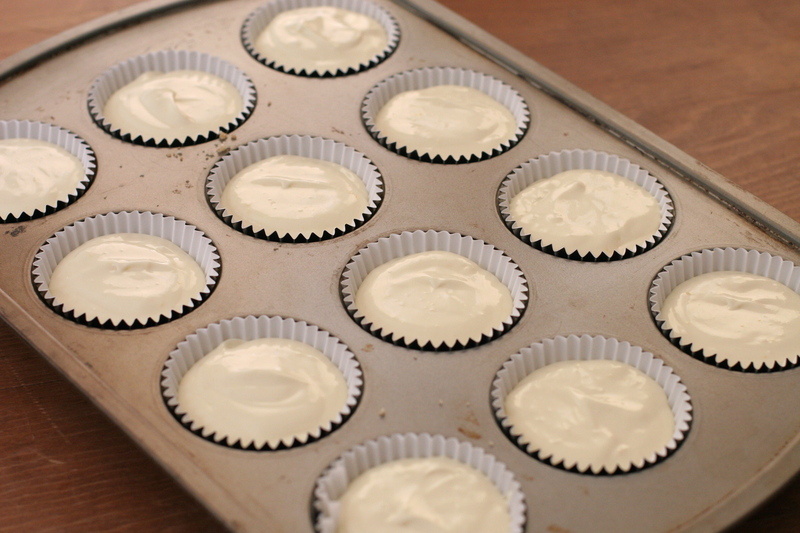 Unlike their larger cousins, mini-cheescakes bake right in muffin liners in the pan so you don’t need a water bath which means you can whip these up anytime you’re craving cheesecake. In a food processor, whiz the cereal and brown sugar together until the cereal is finely ground. 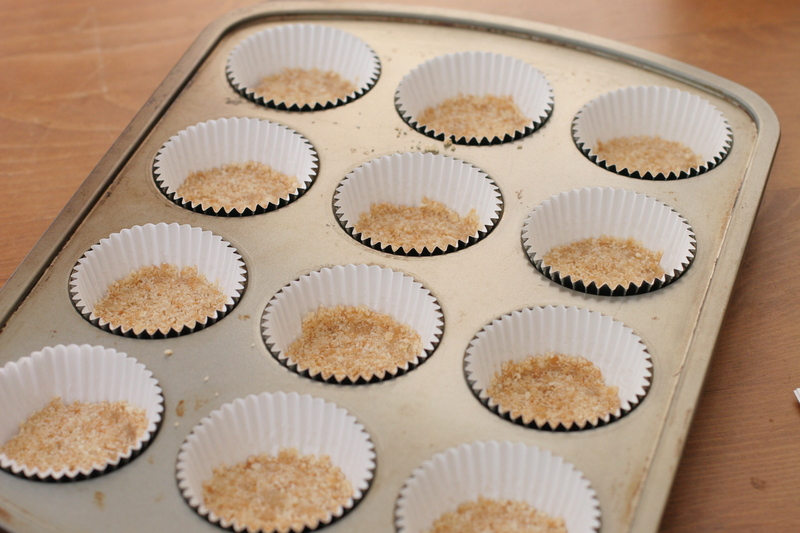 Add the melted butter in a stream until the crumbs are moist. 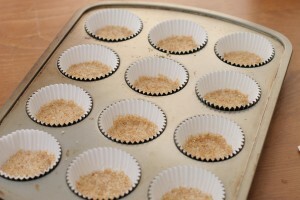 Distribute the crumb mixture among 12 muffin liners in a muffin tin; press down with your fingers to form a bottom crust and set aside. 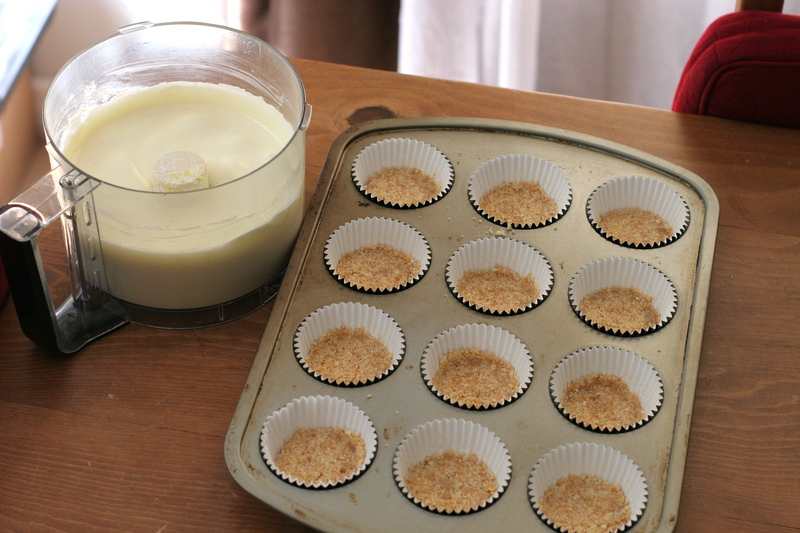 For the filling: Combine the neufchatel cheese, yogurt and agave nectar into a food processor and blend until smooth. Add the egg and egg yolk and blend until well combined. Add the vanilla extract and lemon zest and mix until smooth. 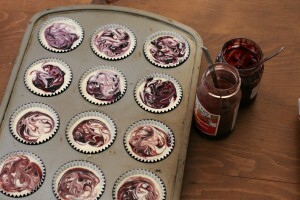 Pour the filling into each muffin cup about 3/4 of the way full. 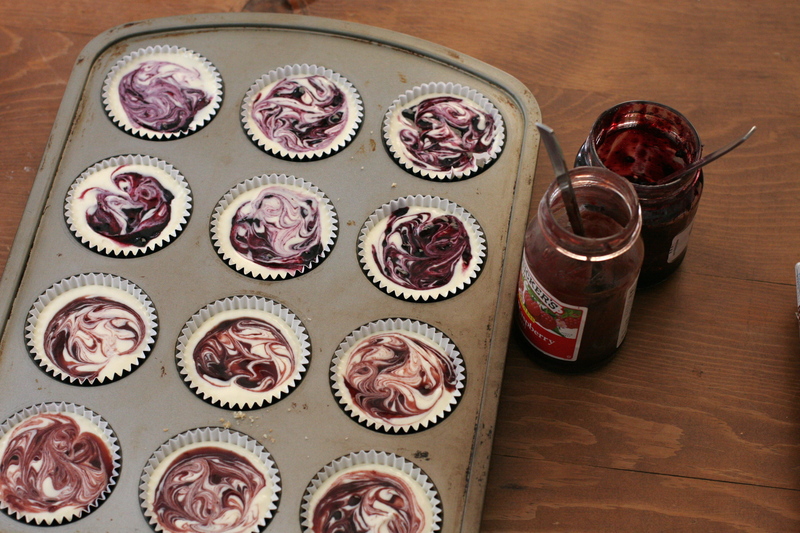 Put a heaping teaspoon of your favorite jam in each, then take a toothpick or the tip of a knife and swirl the jam into the cheese mixture until a pretty pattern forms. Bake the cheesecakes for about 18-20 minutes, until the edges look relatively firm and the middle is just firm (read: they still jiggle a tiny bit!). Cool on a rack for an hour, then refrigerate for at least an hour- longer if you can. These keep in a covered container in the refrigirator for four days. 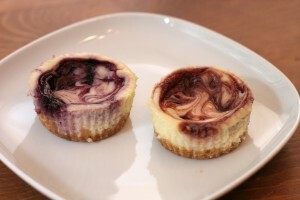 This entry was posted in baking, cheesecake, desserts, healthy cooking, home cooking, recipes. Bookmark the permalink. I was looking for a recipe to make this weekend and looks like I’ve found it!! Grape nut crust = GENIUS! I would never think to make a crust out of cereal! Speaking of… have you tried Scoops’ brown bread ice cream? The not-so secret ingredient is Grape Nuts. Looks yummy!! I need to try it! Gisela: Let me know how it goes- I’m not a huge fan of “low fat” baked goods but these are really good. I bet your guests won’t know the difference! Diana: I’m a sucker for a grape nut, what can I say? It’s funny you should mention that particular flavor- my twin sister lives in Ireland and when I visited her last year I fell in LOVE with brown bread. Can’t wait to try the ice cream. Kayo: Genki?! Gohan ishouni tabemashou ne?! not bad at all, that looks awesome!